You are currently browsing the category archive for the ‘Saint Louis’ category. Bye bye 2009, Hello 2010! A new year already! Sheesh how does it ALWAYS sneak up on me? Lock and Key Press has had a tumultuous year, full of lots of wonderful things, and a few really awful things. But like they say you have to take the good with the bad. But right now, I’m just taking time off. Since this almost 2 year shuffle between Chicago (<3) and Saint Louis (</3), I've become extraordinarily burnt out. Working 7 days a week, lots of heavy lifting (see previous posts), and a lot of emotional stress (its amazing how many calories you burn with worry) necessitate a wintertime hibernation period. I've done the holidays, eaten my fill of cookies and egg nog, welcomed the new year under a Blue Moon and now I’m taking off my shoes, putting on my sweats and not taking them off til spring, or until I get too bored and have to put my apron on and get back to printing. It is a well deserved winter vacation, and hopefully the spring will bring about a more stable existence for me with more time printing and snuggling cats and boyfriend and less time on the Amtrak. To you and yours, a Healthy, Wealthy, wonderful 2010! See you in a few weeks, refreshed! Now available for sale on Etsy. 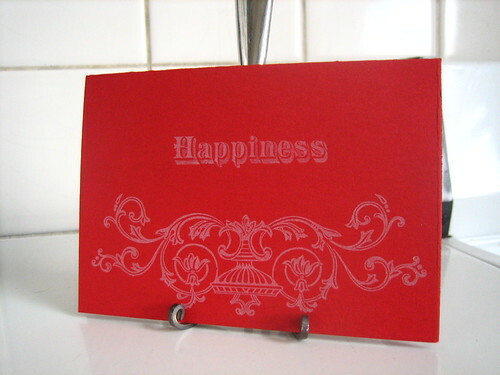 Happiness Note Cards. 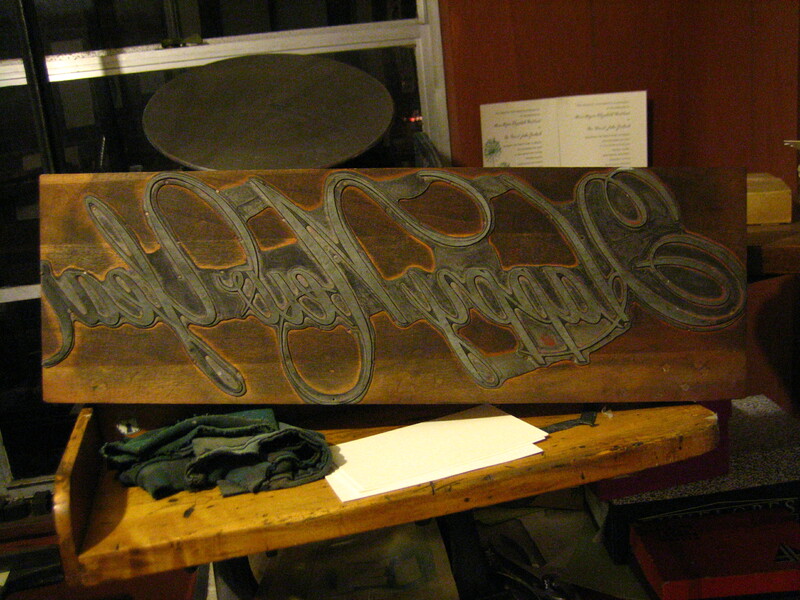 Hand letterpressed using antique lead type and a Victorian woodcut. Soon to be the last prints of the cut, as it is very old and delicate and won’t stand up to being printed for much longer. 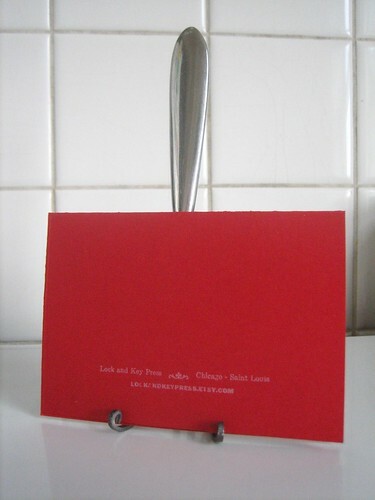 Set of four cards, blank inside, single fold with plain white envelopes. 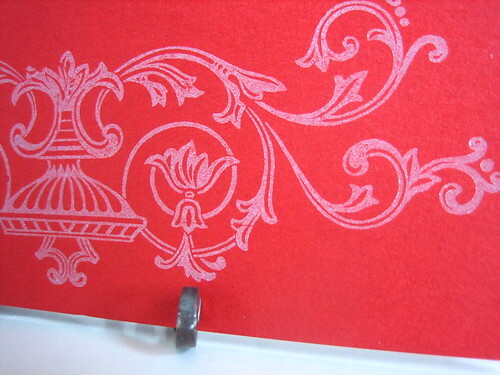 A great birthday card, “I Love You” card, wedding congratulations or Baby Announcement! So many things bring us happiness, and this card can express it beautifully. Pulling a print for the kids. 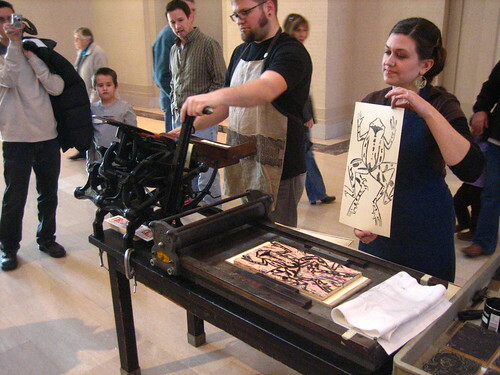 On Sunday I was invited by Eric of Firecracker Press(where I teach letterpress printing classes), to participate in some demonstrations of printing techniques to coincide with the opening of the Ming Dynasty Exhibit and the on-going Nocturne of Printmaking at the Saint Louis Art Museum. 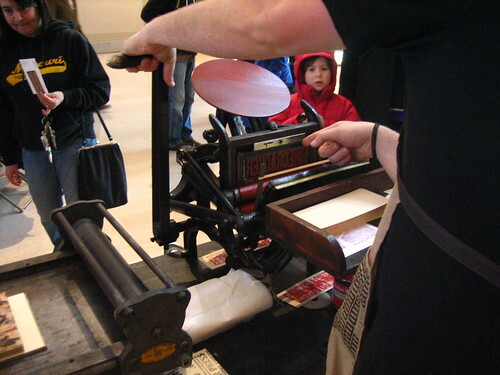 We dragged two small presses to the museum, a 100+ year old Baltimore table-top press, and a flat bed proofing or sign press. 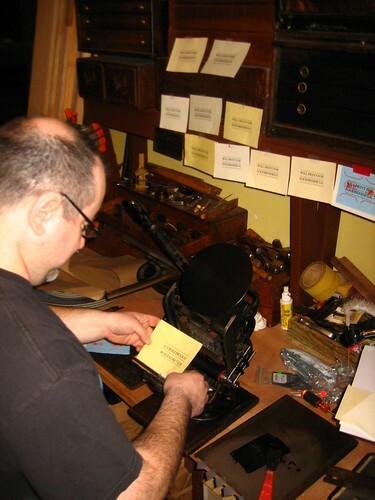 I had a few wood and linoleum cuts to put in the proof press, and Matty manned the Baltimore with hand set wood and metal type. The kids were either very impressed or not impressed at all, and most of them were happy to receive a print or two that I made right in front of them. I love kids and it was a LOT of fun to show them how I do what I love, answer their questions and make sure they used their pleases and thank yous when requesting prints. 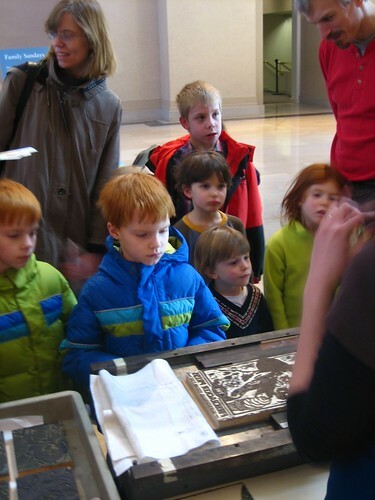 :) One little African-American girl, maybe 4 years old with super cute hair in tight little pipe curls watched intently and as I lifted a print form a wood block she literally squealed in and jumped up and down in amazement. That cracked me up. I think her mom was surprised at the reaction. 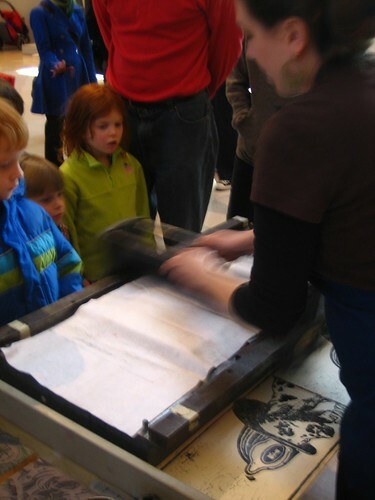 Perhaps we had a future print maker in our midst! The Post-Dispatch was there filming too, so when the video and story are up I’ll post the piece. Lock and Key will be on Holiday until 2 January so that I can visit with family, get going on some jobs and print up more product to keep in stock. Have a healthy, happy holiday and a prosperous New Year!